Outdoors, east of Natural History Museum, along 9th Street between Madison Dr. & Constitution Ave. The Pollinator Garden is composed of four habitats: wetland, meadow, wood's edge, and urban backyard. Informational signage discusses the connections between plants and butterflies and explains the life cycles of butterflies. As many as 30 species of butterflies may be attracted to the native plants during the blooming season spring through fall. 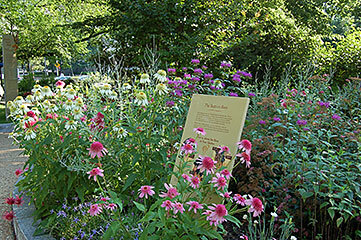 The garden is a joint project of Smithsonian Gardens and the National Museum of Natural History, with partial funding from the Smithsonian Women's Committee.